Can You Eat Dandelion Leaves? The dandelion may be the source of frustration for many gardeners, but its medicinal uses have been applied since ancient times. Dandelion belongs to the genus Taraxacum and populates most of the warmer temperate areas of North America. Dandelion has been used for centuries for such ailments as dyspepsia, liver and spleen ailments, anorexia and hepatitis, according to a 2006 review in the "Journal of Ethnopharmacology." As with all herbal treatments, consult your physician. Dandelions love the sun and their leaves open during the day and close with the night and overcast weather. Both the flower, the leaves, and the root are used for various medicinal purposes. Dandelion is a cornucopia of vitamins and minerals. It contains A, B complex, C, and D, as well as the minerals zinc, potassium and iron, according to the University of Maryland Medical Center. It also contains carotenoids, terpenoids, choline, phytosterols, asparagine, carbohydrates, pectin and phenolic acids. Dandelion root tea is used for a diuretic, according to the American Botanical Council. However, UMMC states that the tea from the leaves is used to encourage excretion of urine. The dandelion root is a herbaceous root, meaning the stems and leaves die off at the end of the growing season. The root is brown and brittle and produces a milky white fluid that is bitter to the taste. The tea is made from 1 tbsp. of the plant steeped in hot water. Before using dandelion, consult with your physician. The American Botanical Council lists the uses for dandelion -- flower, leaves and root -- as dyspepsia, disturbances in bile excretion, encouraging diuresis and appetite stimulation. Because of its antioxidant properties, dandelion may also be used for boosting the immune system. The dandelion herb, leaves and flowers, may be used for treating high blood pressure, flatulence and constipation, but always obtain the opinion of a doctor. Dandelion leaves are also used in salads and wine-making, as well as a coffee substitute. Using dandelion root tea, or any dandelion product, should only be done under the supervision of a physician. Side effects may occur using the plant such as allergic reactions, sore mouth, heartburn, skin irritation or gastric hyperacidity. It should not be used if you have blocked bile ducts or a gallbladder infection. 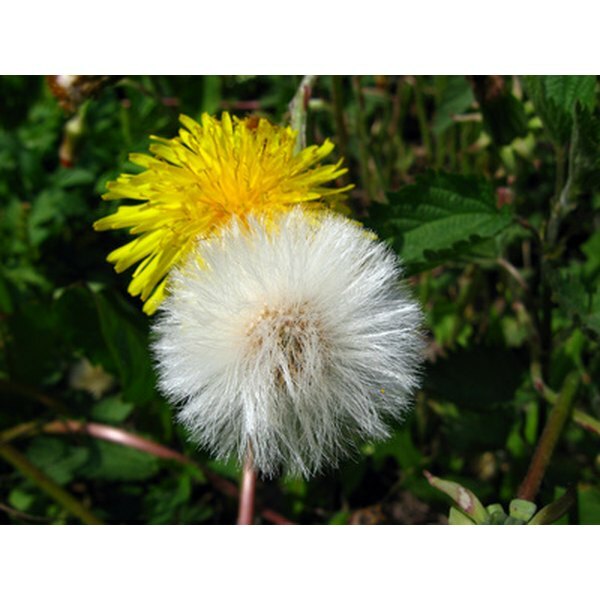 Dandelion has also been known to interact with antibiotics, antacids and lithium. If you have allergies to chickweed, ragweed, daisies or yarrow, you may also be allergic to dandelion.